It is ironic that Greece - a tiny economy that is a mere 2.2% of the Eurozone and not even among the top 25 economies in the world - has produced so much turmoil. But there has always been a fundamental flaw in the design of the Eurozone. Europe created a single currency without adequate fiscal policy coordination. Very competitive economies like Germany were joined together with uncompetitive economies like Greece. Nevertheless, I remain cautiously optimistic. This is because, despite what many critics say, Germany is playing its cards right. Many argue that Germany should come up with a dramatic solution to the debt problem. Chancellor Angela Merkel is not leading, critics charge. I disagree. Germany has a good reason for being sluggish. It is trying to force countries like Greece to enact meaningful reforms. The German concern is that if they come up with some dramatic solution to the euro crisis, such as guaranteeing everybody’s debt, financial panic would end but countries like Greece and Portugal would feel no pressure to undertake necessary reforms. These countries would not get their budgets in order; they would let their fiscal houses continue to crumble; they would not become competitive. All of Germany’s leverage would evaporate the moment it wrote the check to its neighbors. Indeed, a couple of weeks ago, Germany watched as the European Central Bank responded to a financial scare in Italy by intervening. The situation stabilized. Then the Italians immediately began watering down their commitments to enact economic reforms. This is Germany's nightmare. It's what they're working so hard to avoid. Understandably, Germany is trying to force as much real reform out of debtor countries as possible before writing checks or making guarantees. Germany is doing this not just for sound economic reasons. There are also political motivations. Angela Merkel couldn’t do it any other way. 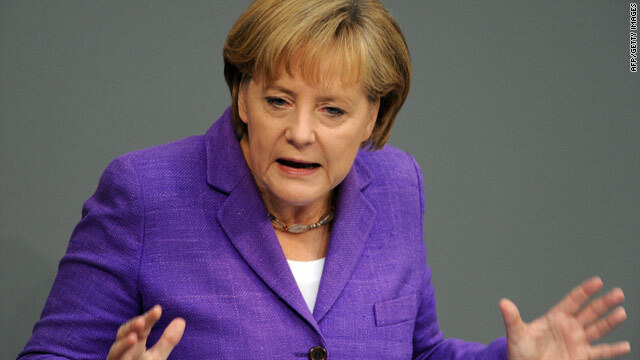 The German taxpayers would revolt if she suddenly guaranteed the debts of countries like Greece. They would feel like they were falling into the same trap that caused the problem in the first place. For these reasons, you’re not going to see dramatic action from Germany. What you’re going to see instead is some complex solution that places pressure on Greece and other countries to reform while at the same time reassuring markets that Germany will not let the euro fail. This is understandable and sensible, but it will not satisfy the markets, which want a simple, clean solution. For this reason, the Germans are flirting with disaster. What is likely to emerge is a complex, incremental solution. The markets will have to learn to accept it. The part that I worry about is that even after all of this, Greece is probably not salvageable. It has too much debt and, fundamentally, it is not a competitive economy. It doesn’t make anything anyone wants. This is not true of Spain or Ireland. Spain and Ireland are quite dynamic economies that got hammered by the financial crisis. So the real question is whether there is some way to ring-fence Greece from the rest of Europe. Perhaps then there’s a scenario in which the Germans guarantee all remaining debt. The truth is: Greece has defaulted before. There’s a book out that says that since it’s independence in the 1830s, Greece has been in default for 50% of its national existence. The difference is that now the Germans are willing to bail the Greeks out. That’s what’s new. Europe is trying to create a greater, integrated economy. And this project has gone on for 25 years. For 25 years, everyone has said it’s all going to collapse. But it doesn’t collapse. In fact, far from collapsing, Europe has gotten in some ways larger, stronger and deeper. Now this crisis is clearly the biggest challenge Europe has faced. And Europe has reached this point because the currency was badly designed. I can’t be sure Europe will get through this mess. My best guess is that, eventually, the solution will come from the European Central Bank (ECB). Like the U.S. Federal Reserve, the ECB has a lot of power and leeway. If it just started guaranteeing or buying various kinds of debt, it would be able to stabilize the euro. And that’s also politically more palatable. If the German government has to “recapitalize the ECB” that sounds much better in German than saying “we’re going to bail out the Italians” - even though effectively it is the same thing. Papandreou's bid worked. He called the opposition's bluff and as a result the opposition backed down. Overall, I think Papandreou has handled this in a pretty clever way. Interestingly enough, as a footnote, the leader of the main opposition, Antonis Samaras, and Prime Minister Papandreou are not just people who know each other. They were roommates in college in Amherst in America. Today they are going through this titanic tussle in Greece. You have to wonder what it’s like to be acting out a great drama on the world stage with your college roommate. « Previous entryIs Netanyahu bluffing once again? To claim that Greece doesn't make anything that anyone wants is very arrogant. I wonder if Mr. Zakaria has ever had Olive Oil? This crisis is the wakening call that Europe needed to formalize the discipline required by the Eurozone. Europe will be stronger and united or Europeans will be "sucked" by the rest of the world. Any solution to anything designed by politicians neccessarily MUST eventually fail. I´m an American citizen living in Europe, Norway to be precise. Without our oil revenues we might have been in quite a mess in this country as well. And who knows what might lie ahead? However, what continues to amaze me is how Americans can continue to "educate" the rest of the world on how their economic woes should be solved. This is arrogance bordering on stupidity. Everyone knows America´s economy is on the brink. Find a solution to that before you start lecturing Europeans! Gemany can help like it helped poland in1939/ by invasion. I think that Papandreou showed clear lack of leadership, and it's a great news that he'll go. And a lack of conditions to create a leader might be the real issue. @midwestgrl – Huh? Does mommy know that you are on the computer again? Living in Germany and seeing the euro developing over the last two decades, it's hard to see the society losing more and more of its living-standards. Germany looks "clean" and beiing intolerant and losing good-will/ openess for the single individual. Living costs are rising, there is more and more controll of people, more bureaucratism and laws and rules. Government like to plan and organize everything people do, want to know everything and mingle in private affairs. I don't like to see A. Merkel telling the Greek what to do and how to spend their money. "Am deutschen Wesen soll die Welt genesen?" Oh please no! Unity in the eurozone over the years worked only for the sake of big-business and money-interests. Big media produces films and books full of clicheys and rosy images with stereotypes. Grrr... cheap euro-universalism with a bad taste! Liberalism and socialism = hopelessness. In defense of german sluggishness? Ok, so, I it ok to pour millions in massively indebted US states, but not in the EU's member countries, right? You are confusing sluggishness with lack of political vision. It is not a question of austerity (I will admit cooked books as long as you will recognize that, given a proper platform, the Greek, the Italians, the Portuguese or any southern european, for that matter, will be as hard working – if not more – as the next man. This asinine reasoning is festering again, apparently, forgetting to acknowledge that the german reconstruction and growth depends (and shall depend even more) of the European community. When the chinese start building cheap mercedes-like cars who won't break down when you turn on the ignition, you'll get what I mean. As for the crysis per se, let me remember you that germany was one of the first to recommend budget excesses. Countries like Portugal – endemically "unproductive" – were on their way of making the much needed reforms. But our reforms (I will speak only of what I know) require debt. Education, specially, and reworking the entire productive sector. Now we have no future. How can they expect us to pay the debt with a recessive economy? The supposed "careful" sluggishness – as I though we all could see – is nothing but a mindless reaction to pressure. Italy and Spain will eventually breach. The modus operandi is basically the same. And then will Fareed say it was good to do things slowly? How long will it take until the EU leaders (the "Merkozy" directorate that operates out of the Parliament) summit again to come up will some "miraculous" solution again? And how long will it take until the markets are on the prowl again? How many times did it happen so far? Sluggishness? This s plain idiocy. This is not a question of "finacial ethics" or of "productivity". It is a matter of inflation and deflation. The German don't want the ECB to print more money (weimar inflation trauma, or something) and that will be the end of the currency. The teutonic reasoning calls for "racionalization" and "austerity". I can understand the fundamentals of this philosophy. But it is bred out of ignorance. The Portuguese, for instance, retire at 65 y.o. and work 40 to 42.5 hours per week (well, I work 60 with no over time). We also have a average income of 1000 euro and a minimum wage of 485 euro per month. Now add to that a basic sustenance (food, housing, cars, everyday commodities) that is par to the average european pricing ranges. Difficult, eh? Not to mention the worse of all... the EU effectively financed the "dillution" of out productive fabric. In exchange for cohesion funds (VERY badly managed as well, by our governments of course) we gave up most of the production. In agriculture, for instance, people were paid to get rid of crops, tractors, teams... because, of course, the EU couldn't get rid of all the frech surplus, for instance. So, small EU economies aren't here "living off the generosity" of the german or french tax payers. We are here to absorb their production. And we are instrumental in their growth and welfare. Because you have to sell what you produce, right? So go preach morality to somwone else. And fail to see the obvious: sovereign debt is the new cash cow. And, by god, it shall be milked as far as it can. The longer it takes, the worse it will be. JOE, Italy is currently ruled by a right-wing party. Greece was being ruled by a right-wing party (who cooked books et al.). The republican led US government allowed the mounting of a speculation system and the demise of the Lehman Brothers. Now you ask your "socialist" president to clean up the mess and you throw the responsibility upon him. Great! Lack of regulation and a voracious system led to the demise of the western industrial capacity. It seems that you are taking "socialism" as "social democracy" (or people-oriented, interventive forms of government) or "welfare" states. Well, perhaps you should know that the system that you criticize has been the corner stone of the reconstruction and growth of the european nations. Not only it allowed them to escape from the claws of totalitarianism (fascism, dreadfully present in the heart of europe, and communism, a looming menace right on the border) but also served to cater for the US great post-war dynamism (as in europe paying for the stuff you supplied). Healthier, happier people, who could for once shake off the fears of unemployment and abject misery are the foundation on the european construction. The system relies on the good-will of everyone and the constant abuses – as well as systemic external factors like immigration and low birth rates – are degrading it. But this "socialism", as you call it, is the most productive engine behind capitalism. If you want to be fair and honest and if you want to be regarded as trustworthy to your readers, then you may inform them that Germany defaulted three (3) times during the last century. This is to say that Germany defaulted one (1) more time than Greece in the 20th century. And when we talk about Germany’s default we don’t talk about the default of a “tiny” economy. As about Greece, a little search in history does not harm. This “tiny” land has always been viewed as a protectorate by the global players of each time (as perhaps your country of origin). It really looks like Merkel can put away the sausage and beer! The new PM for Greece will be a bankster puppet, there will never be a chance for a referendum now, anything the European banks want will be passed immediately without debate. The banksters have decided the streets of Greece will have to run red with blood before they will be allowed to default. It would seem to me that any patriotic Greek should now work even harder to avoid paying taxes for as long as possible, your enslavement has been agreed to and you will serve your German masters for the next few decades!
" Ανοικτός! Το παράθυρο ΜΕΝΕΙ ΑΝΟΙΚΤΟ! " You realize therefore significantly with regards to this subject, produced me in my opinion believe it from so many various angles. Its like men and women don't seem to be interested until it's something to do with Lady gaga! Your own stuffs great. All the time care for it up! signs of power ache or coronary heart disease. Sporting brief curls was probably the most popularly adopted type. Long sideburns too have been a serious trend during this period.